Has Marc Jacobs spent too much time hanging around with Richard Prince? The celebrated fashion designer collaborated with the iconic appropriation artist on the latest insta-"It" bags from Louis Vuitton -- and might have picked up a tip or two about copying in the process. 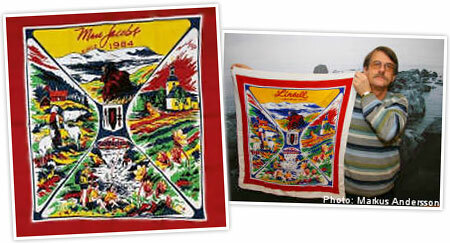 It seems that a scarf celebrating "Marc Jacobs since 1984" may originally have read "Linsell," the name of the small Swedish village it depicts. And now one of Linsell's native sons, Goran Olofsson, claims that his father Gosta created the scarf along with other tourist souvenirs in the 1950s, and that he potentially inherited his father's copyright. Historians of tourism (yes, really) and international copyright lawyers will no doubt spill a great deal of ink over this small square of silk. But before the war of words gets underway, what are the basic legal questions? Initially, assuming that Gosta Olofsson is the original artist, was the design protected under Swedish copyright? And for how long? Next, if the scarf was indeed copied, where did the copying and distribution of the scarf take place? And was a copyright in the design also recognized under that country's (or those countries') laws? Marc Jacobs presumably designs whereever he goes, but principally in both New York and Paris. 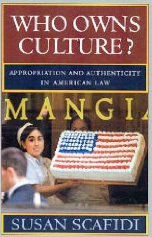 Until 1990, copyright protection in the U.S. was dependent upon a series of formalities, including registration with the Copyright Office -- something that a foreign souvenir-maker would've been unlikely to consider. No registration, no protection -- and the work would've been part of the public domain. But wait, not so fast. Section 104(A) of the U.S. Copyright Act provides for restoration of copyright in some foreign works that fell into the public domain because their owners failed to comply with then-required U.S. formalities. If the original Olofsson work meets the requirements of this section, it could still be subject to copyright in the U.S., though the law also provides for a period of immunity for parties who relied on the work's being in the U.S. public domain. On the other hand, countries that were members of the Berne Convention for the Protection of Literary and Artistic Works back in the 1950s, including both France and Sweden, would offer artists from other member nations the same copyright protection as they would their own citizens -- without formalities and irrespective of the law of the country of origin of the work. Thus, if the alleged copying and distribution took place in France, the relevant copyright law would be French. And the analysis continues...for every country in which Marc Jacobs may have distributed the scarf. Then, of course, assuming valid copyrights and actual copying, there's the question of whether the younger Mr. Olofsson actually owns the copyright, or whether long-lost Swedish half-siblings or aging co-creators will suddenly appear on the scene. At the end of the day, it's a safe bet that it will cost a krona or two to figure out whether Marc Jacobs borrowed a work from the public domain, infringed a copyright, both (in different jurisdictions), or neither. And if all of this sounds as incomprehensible as a recipe from the Swedish Chef, well, welcome to the wonderful world of international copyright law.